Status: Contest finished on 28-11-2009. 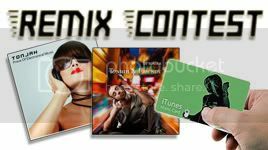 New remix contest by Dj Tonjah. The 5 best Remixes will be released on upcoming Tonjah Album “Tonjah & Friends”. The best five Remixes will be on the Christmas Release to feature Tonjahs new Tracks. The 1st, 2nd and 3th Place will also win ITunes Vouchers. Use this Vouchers to give the new Album to your friends and family as X-Mas present. When you have sucessfully registred you will get a download link within 24 hours. Then you could download the raw files of “Riding Low”, “Vince” and “Synthback” – usable for Cubase, Acid and Ableton. Make your own remix, the genre – never mind! The Contest starts on the 2nd November 2009 with the Download-Wave. That means you get your Download-Links. In the weeks between the 16th and 28th November we start the Upload-Wave. Then please upload your Remixes in the Backend of Tonjahs official Website. The short and final Voting-Wave starts from the 1st December to the 6th December. In this time Tonjah will choose the Tracks for “Tonjah & Friends”. By the way “Tonjah & Friends” will be an Album Release Double-Sided with about 16 Tracks.